Pain, suffering, burdened, finished, etc. It is so bizarre how all these things seem to hit you at once. One moment you feel like you are on top of the world and the next you are at the bottom of a well screaming for someone to pull you out. Never before in my life have I felt the changing of emotions so strongly. Maybe it’s because, in America, life moves at a more rapid pace and all the distractions inhibit ones ability to follow the swinging pendulum of life. It could also be that, in America, I don’t sound like a two year old and can express at assert myself more readily. It is also very possible that the need to prove myself and understand the purpose of my work is not so intense. There are many reasons to justify my recent unstable state of mind. However understanding why life is so much harder here does not make dealing with my struggles any easier. The last month has been the longest and most trying period thus far. I felt quite powerless as I observed my life unfolding before my eyes. I found myself lost in an abyss, unable to justify my actions. Because of this lack of control I was overcome with guilt. It was like a cloud of guilt was following me wherever I went. It was guilt of not being stronger, not being able to fight through, and succumbing to my weakness. Confusing weakness with letting go, I refused to be broken! I wish that my competitiveness would subside once in a while. I wish I could allow myself to obey the natural flow of the universe without trying so desperately to control it. This is the battle I am currently. I am growing and the coming to terms with my stuborness is quite an adventure. I have a memory of growing pains from my childhood. I remember being on vacation and being so miserable because my body ached all over. I remember my mom telling me that my body was growing and that the pain would go away. It’s funny how such a physical change can be related to the process I now face mentally. This process of growing reminds me of another conversation I recently had with a friend. We were talking about the 7 year cycle. The “7 year cycle” is based on the theory that your body actually sheds a layer of skin every 7 years. Though science argues that everybody’s rate of change is different, many cultures and mystical theories attribute a magical force relating to the number 7. It is thought to be a year of reflection and stillness, but also a year of deep insight and emotions. Though I am not in this 7th year, I feel as if this process has begun to unfold. It is like my body is preparing itself to shed. This ephianey came to me in a dream that I later contemplated over my ritual morning coffee. I saw myself so clearly being transformed. In this image I remember thinking numerous things about growth, but the one that registered strongly was the idea of shedding skin. I was standing naked in the middle of space with my hands at my heart. They preceded to remove my skin like a thick winter coat. As it was being removed, a powerful white light engulfed me. I can relate it to the Little Mermaid when Ariel is transformed into a human. A powerful moment that physically and emotionally alters you into a new person, a new state of being. That word “ignore” struck a cord with me. The way he wrote it made me question whether ignoring this pendulum of life is an option. I don’t think we can ignore it entirely but we do have the decision to dive into it or not. We also have the capacitiy to be aware of the shifts within our body. We have the ability to embrace the pain and pick out the thorns as much as we have the ability to prevent ourselves from feeling it at all. Distractions are a good vice for escaping and I find that, in my current situation, all my vices have been removed. Senegal has made it more difficult to ignore the rawness of life. This theme is being woven into my soul and it is something that comes up frequently in my journal entries, emails, and blogs. I would like to conclude with acknowledging the process within you. I don’t think you have to travel around the world to face these types of challenges. You can be anywhere in any type of situation and feel the need to grieve. Grieve for that layer of skin you are loosing and bathe in the pain that the sorrow brings. I think we as humans need to do a better job at accepting this process within ourselves and within others. If we are more honest in our challenges then the possibility to relate on a deeper demension of life becomes achievable. 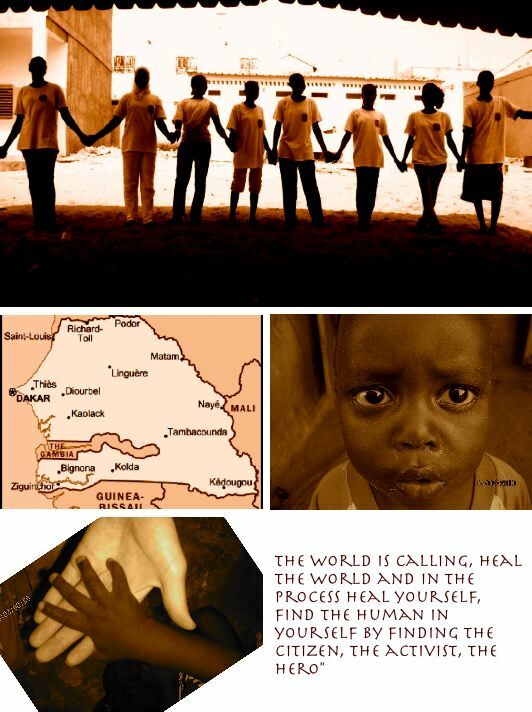 Maybe then we can heal ourselves in this crazy world, together. P/S Next blog will be about Senegelese food, the market and all that good stuff!